ALBANY, GA (WALB) - With the warmer temperatures, some people are looking for ways to stay fit and cool. 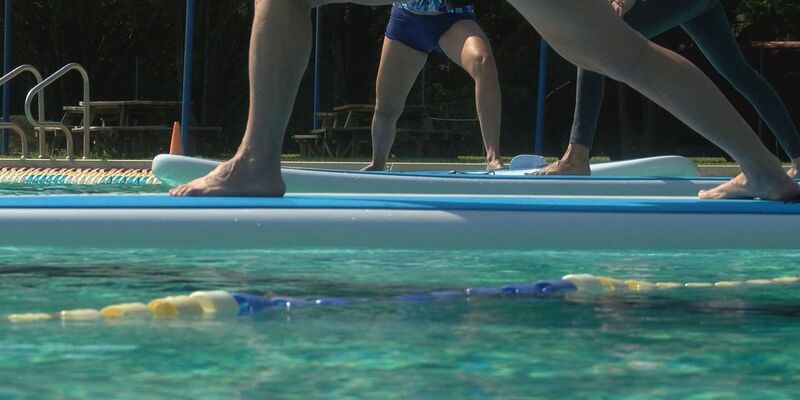 Recently, the Albany Area YMCA began offering stand-up paddle board yoga. Although it looks different from your standard yoga, class instructor Donnette said one lesson remains the same. "It's finding a balance between strength and relaxation," she said. Donnette has been practicing yoga for over twenty years now. She said yoga is a good practice that people can easily study. "There's plenty of books, plenty of videos, there's YouTube," she said. However, for those who want to take the plunge, the stand-up paddle board yoga offers a number of added benefits. Donnette said breathing in the fresh air is a plus. "The next thing is water is very calming. It's very natural for the body being surrounded by water. We are of water." Those who are switching from yoga mats to paddle boards are enjoying the experience. "They notice that they're strengthening their ankles, their knees, their hips, and their awareness. It humbles you." Donnette recommended bringing a towel, a pair of sunglasses, and a hat. They'll provide the weights and the board. Classes are held Tuesdays at 9:30 a.m., Thursdays at 6:00 p.m., and Saturdays at 10:00 a.m. at the Sports Park located at 4508 Gillionville Road. Each class costs $15 for members and $20 for non-members. For more information, call the Albany Area YMCA's Central Facility at 229-436-0531.